As members of the Jama’at are aware, I was visiting Japan to inaugurate their first mosque. If we examine the conditions in Japan, it seemed very difficult for this mosque to be constructed. Our lawyer there, who is Japanese, met me and congratulated me but expressed his surprise and wonder how it was that we were allowed to construct this mosque in this area. He said that I was indeed fighting this case for you but I did not have any expectation that I would be successful. This is why, at one stage, I had told the people incharge of the Jama’at that it would be better for them to abandon this idea. But the reliance of God of the members of the Jama’at is strange indeed and they said to me that you keep striving and Insha’Allah we will be granted this place and construct this mosque. He said that for me this mosque is a wonder and a sign and an amazing thing. This is indeed the grace of Allah, the Exalted, upon the Jama’at which He goes on bestowing upon the Jama’at all the time and thus goes on increasing our faith in Him. There is a time decreed by Allah, the Exalted, for each task and when the time arrives, the work gets done by the Grace of Allah, the Exalted. When Allah, the Exalted, decreed that this mosque should be constructed, He enabled us to construct the mosque despite all the obstacles and thus was established the first center for the spreading of the message of Islam in Japan. There is no doubt that one mosque or center cannot fulfill the needs for spreading the message of Islam in the whole country but this is certain that at least we have laid the foundation for spreading the true teachings of Islam in the whole country. I will present a few narrations of some people in Japan which will illustrate how the Japanese are viewing the true teachings of Islam as presented by the Ahmadiyya Jama’at. And this was destined to happen through the true servant of the Holy Prophet Muhammad (sa). Thus just as the Promised Messiah (as) had expressed his intense desire for the spread of the message of Islam to the rest of the world and also exerted himself to achieve those goals, he also stated with respect to Japan that a book should be written for the Japanese. And he wanted a most fluent and capable Japanese person to be paid a thousand rupees to translate this book and then he wanted 10,000 copies of this book to be printed and distributed in Japan. He also said that pious souls will accept Ahmadiyyat in Japan. Alhamdulillah besides Holy Qur’an, there is literature being prepared and available in thousands and is being spread. And now with this mosque Allah has opened such avenues where tens of millions are receiving the message of Islam as was the desire of the Promised Messiah (as). The locals were conveyed teachings of Islam and they have changed their opinion of Islam. They recognized and openly expressed their feelings that that by partaking in the reception of the mosque, they have learned the true teachings of Islam and our false notions about Islam have been removed. The Promised Messiah (as) stated that if one wants to introduce Islam, construct a mosque. People will be inclined towards it. We see this being fulfilled everywhere and also in Japan. And when one sees how by participating in the inauguration of the mosque the views of people changed so completely one is left amazed. On Friday, many guests came to the mosque. First they had an open house. Then they heard the sermon & saw the prayer service. There were some 49, 50 Japanese guests from various faiths and government officials, professors present. Director of Public Affairs of Church of Jesus Christ: We hope that this mosque will serve as a bridge between Islam and the Japanese people. Priest: As a Buddhist, it felt really nice to enter a mosque. We thought it is not permissible for non-Muslims and Buddhists to enter the mosque but not only were we welcomed warmly but by joining the prayer and the sermon we were heartily pleased and our impression about Islam changed. Member of City Parliament: We welcome the mosque in our area and we hope that in accord with the stand of the Ahmadiyya Jama’at this mosque will become a center for those who love humanity and who love to serve humanity. Member Parliament (traveled 1,000 km to attend): When I saw this beautiful mosque, my fatigue was eliminated. The Ahmadiyya Muslim community has earned a great reputation through their humanitarian service at the time of the earthquakes and we hope this mosque will cause this good name of the Ahmadiyya Jama’at to increase. Professor of University: It was very important for Ahmadiyya mosque to be constructed in Japan. This was a great need. The role of the Ahmadiyya Jama’at in conveying the beautiful teachings of Islam in the world is very prominent. We hope that through this mosque the Jama’at will be even better known and real peace and security will spread in the world. The Jama’at in Japan is small but many guests from various nations were visiting the reception and thus there was great lively scene at the event. There were as many guests as the local members. Many nationalities were present. The Jama’at in Japan discharged their responsibility vis a vis hospitality in a very good manner to the Ahmadis from various nations. On Saturday evening a reception was held in the outside area of the mosque. 109 Japanese and eight non-Ahmadi guests attended. Guests included politicians, directors of international tourism, professors and members of other professions from society. Priest: The leader of the Ahmadiyya community came at a right time when we were experiencing sorrow over events in France. The fear we had of Islam during these days has been eliminated by the simple and beautiful way in which he has expressed the teachings of Islam. Lawyer: This is the best day of my life. Everything Imam of Ahmadiyya said was based on truth. Where he has mentioned the need for peace and gentleness he has also mentioned the need for the spread of justice also which is very much needed and very good to hear. University student: My home and family are associated with Buddhism and my house is a temple. I had great interest in Islam but had never had the opportunity to speak with any Muslim. I have read whatever I could in books but participating in this opening ceremony and by listening to the Imam of the Ahmadiyya Jama’at I have seen the true picture of Islam and a new chapter of my life has opened up. A lady says: I want to thank you for this invitation to participate in such a great event. It is a matter of great joy for such a beautiful mosque to be built in this city. I am a university student and am studying different religions. After participating in this ceremony I have recognized that our understanding of Islam is very limited which is why we have many misconceptions. The address of the Imam of the Ahmadiyya Jama’at is the need of the hour. I have learned a lot about Islam through this address. We the people of Japan do not know much about Islam. We generally fear Islam but today’s speech showcased what Islam really teaches. By participating in this event I also discovered that by merely reading books about Islam and its history we will not be able to see the true face of Islam. This is so because most of the books that they read are written by western orientalists. So many more such events should be organized in the future as well. After the building of this mosque I believe that such occasions shall arise in the future. I was able to meet the Imam of the Ahmadiyya Jama’at and I saw in their faces mutual love and peace. Another Japanese Guest: By joining this event and listening to the speech of the Imam of the Ahmadiyya Jama’at I was able to think about the peace of the world. I am sincerely grateful for having been afforded this opportunity. Imam Jama’at Ahmadiyya talked about peace and made the world aware of the hidden dangers. The Imam of the Ahmadiyya Jama’at also removed those fears of ours that the Muslims want to take over the world. I will say again and again that we should join hands with them and work towards peace. It is incumbent upon us to learn and understand more about Islam. Another Guest: By hearing the speech of the Imam of the Ahmadiyya Jama’at, I realized we really need to understand the basics of Islam. Japan is an island and the people of Japan are cut off from the rest and therefore unaware of the teachings of the others. This is why they know nothing of Islam other than what they hear of the news related to terrorism. I hope the coming of the Imam of the Ahmadiyya Jama’at and the construction of this mosque will be a source of changing opinion on Islam. Another Japanese Friend says: I have never participated in an event of this type before. By participating in today’s reception and listening to the Khalifa of the Ahmadiyya Jama’at I for the first time realized what are the objectives for the construction of a mosque. A Japanese Doctor who is an Orthopaedic Surgeon who met me and has been working with us for the last three years in humanitarian work with us despite the fact that he is not an Ahmadi says: Persons following other faiths like Shintoism, Buddhism etc should have no difficulty in accepting the Islam presented by Imam of Ahmadiyya Jama’at. An Exchange Student from Brazil says: It was a very interesting speech. I have never witnessed such an event of Muslims in Brazil. After listening to the talk of the Khalifatul Masih I have learnt a great deal about Islam. I became quite emotional upon listening to his address. There is no doubt that his words can change hearts. He has told us that Islam does not teach violence. It is clear from listening to him that media paints a picture of Islam which is not correct. A Japanese Lady Guest said: I think this is a day that has changed my life. Imam Jama’at Ahmadiyya has modified my perception of Islam and Muslims entirely. He said that this is not the era of Jihad with the sword. It is an era of Jihad with love. The talk of the Imam of Ahmadiyya Jama’at has made a deep impact upon me. I would say that all the people should come here and see this mosque and learn about Islam from the Ahmadis. Another Japanese Lady Guest said: I attended a previous reception. I participated in that event also but many questions remained. But today the Imam of the Ahmadiyya Jama’at answered all my questions. Now there is no fear of Islam left in my heart. Today I have also learnt that Islam is not a danger for the world but that in fact Islam can unite us all. A Japanese Lady School Teacher said: I met the Khalifa beforehand, before listening to his address. [She had come with a lot of her students, some 15 to 18 of them and there were four or five teachers] The Khalifa answered all of my questions in the meeting and through his address. I now have firm faith that Islam is a religion of peace. I had come here with some of my students. These students were before fearful of Islam but after listening to the address of the Imam of the Ahmadiyya Jama’at and by talking with him they have changed their views. In fact they were very amazed upon hearing this address and began to feel very safe at the mosque. I want that this connection between Ahmadis and the Japanese goes on increasing. She had been accompanied by a Japanese student. He says that this address was a message of peace. I think now that through this mosque the gulf that exists between Muslims and the other people will be removed and Islam will begin to spread in Japan. By the Grace of Allah a lot of people heard about Islam Ahmadiyyat on a grand scale through the media also. I was interviewed by 4 outlets. 3 in mosque, 1 in Tokyo. One of the tv channels of central Japan interviewed me and they have a reach of 10 million. Another news agency also covered our event. There was an interview with a religious newspaper that has a reach of more than 300,000. This is Japan’s only religious newspaper. It is a weekly paper. This interview was due to be published this week and will likely have been printed by now. At Tokyo, a journalist interviewed me as well. He had also said that he would print the interview this week and this newspaper has a circulation of more than 8 million. 5 tv channels and representatives of different newspapers covered the reception. One of the tv stations covered the event by saying that the largest mosque of Japan has been inaugurated today. The tv channel gave 6 minutes of coverage to the event. Their viewers number more than 12 million. In the coverage it is stated that the Imam of the Ahmadiyya Jama’at who arrived here from London said that those who engage in terrorism have no connection with Islam and that a mosque is a place of worship for Muslims and is also a beacon of peace for everyone. He condemned the terror attacks in Paris outrightly. This tv channel had also conducted my interview and has shown selections from those interviews also. Another tv channel with viewership of more than 12.5 million: they aired the news 5 times during the day and said that the largest mosque of Japan has been inaugurated today in the city of Tsushima. The inauguration has happened after the terror attacks in Paris. The Imam of the Ahmadiyya Jama’at came here for this purpose from the headquarters in London. 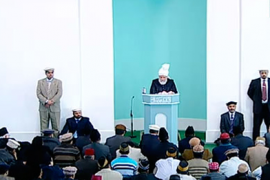 During the coverage they showed scenes from the Friday sermon and the inauguration ceremony. TBS Channel also covered the news. This is a popular tv channel and also has a viewership of more than 10 million. They said that only one week has passed since the Paris attacks and that the inauguration of the biggest mosque in Japan has occurred today. They also said that the community that has constructed this mosque and their Khalifa declared the attacks in Paris un-Islamic and inhuman. They also showed scenes from the inauguration and also picture of the Promised Messiah (as). This news also was broadcast three times in the day. Another news channel with an audience of more than 10 million said that a mosque has been inaugurated after the events in Paris when the negative image of Islam has become even stronger. This mosque has been made by the Ahmadiyya Community and is the largest mosque in Japan. The Imam of the Ahmadiyya Jama’at has declared the attacks in Paris to be un-islamic and has said that this mosque rejects all such violence and that this mosque will be a beacon of peace and anyone is free to enter our mosque. They also showed the scenes of the inauguration, the friday sermon and the impressions of various people. This news also was shown in the afternoon and evening news broadcasts. Nagoya tv that has an audience of more than 12.5 million announced that the largest mosque was constructed and inaugurated in the city of Tsushima, Japan. Those participating said that while their hearts are happy at the construction of this mosque they are sorrowful at the loss of innocent lives in Paris. Prayers were offered at the event for the peace and security of the world. They also showed scenes of the inauguration and the news was shown twice during the day. Through newspapers also great coverage occurred by the Grace of Allah, the Exalted. A newspaper with a circulation of 11.2 million and is a daily and is said to be the largest newspaper sold in the world said in its headline that Islam’s true teachings can be seen in this new mosque. The report stated that this mosque has been built by the 200 member Ahmadiyya Community and that some 500 people attended from various parts of the world and that during the friday sermon the head of the worldwide Ahmadiyya Muslim Community said that the attacks of Paris were a crime against humanity and outright condemned the perpetrators of this violence. And he directed the members of his community to take on the responsibility of conveying the true message of Islam to the people of Japan. Prayers were also offered for the victims of the Paris attacks. Various internet websites covered this news as well. The newspapers covered our humanitarian efforts with respect to earthquake and floods. Another news agency with wide reach covered our mosque inauguration. The readers of all these sites is greater than 15 million. Another newspaper, a daily, with a circulation greater than 8 million published the news that “our belief is to promote harmony.” Then it writes The center of education and training of the Ahmadiyya Jama’at, their mosque, has been built in the city of Tsushima, Japan. This mosque has four minarets and one dome and it is the largest mosque in Japan and some 500 people can offer their prayers in it simultaneously. The second floor of the mosque has offices etc. This mosque’s doors shall be open to all regardless of faith or nationality. This is the Jama’at whose teachings are based on complete peace and love for everyone and they are active in serving humanity and did so in the earthquakes that occurred in Japan. This news was also disseminated by various other sites and the total number who viewed it was greater than 7.5 million. Then there was a news agency that provides news to various outlets numbering 75 and reaches some 6.5 million people. The headings they gave said that this was the largest mosque in Japan and that they desire peace and offered prayers. Then the author says that this growing Islamic community inaugurated its mosque in the city of Tsushima. According to the Jama’at 500 people can offer prayers in this mosque and thus it is the largest mosque in Japan. The Imam of the Ahmadiyya community who had arrived here from the UK condemned the attack in Paris and said that it was a most heinous and inhuman act which would draw the displeasure of Allah, the Exalted. He further added that we do not need a sword to advance the true teachings of Islam, what we need to do is to reform the evil tendencies within each of us. Imam of the Ahmadiyya Jama’at condemned terrorism in an effective way. Another newspaper: The largest mosque of Japan was inaugurated by leader of the Ahmadiyya community. The leader of the Ahmadiyya Jama’at arrived here to do this and has condemned terrorism and said that spreading Islam by force is a false idea. Shedding innocent blood and causing terror draws the wrath and displeasure of God. Through these tv channels, newspapers, internet, in total due to the inauguration of the mosque in Japan the message of ISlam Ahmadiyyat reached more than 52 million people. These are the scenes of the succour and help of Allah that we witnessed by construction of the mosque and conveying to the world the true teachings of Islam Ahmadiyyat. On the other hand, Mullahs are exceeding in their animosity and about this also the Promised Messiah (as) has said: I have firm faith that even if a book on Islam is published by me in Japan, the Clerics will reach Japan to oppose me but only that happens which it is the will of Allah to permit happen. A Pakistani cleric opposed Huzoor (aba) in Japan in 2013 and said that this was the mission of his father that no matter where the Qadianis go to preach they will go to oppose because that is their mission. This cleric had said during that trip of his in 2013 that these Ahmadis are so sincere in their attachment to the Jama’at that they sacrifice their life, honour and time for the sake of the Jama’at. And then he had said about me that because of his trip and because of the activities of the Ahmadiyya Jama’at I shall come to Japan every year and will do everything possible in my power to complete the mission of Khatm-e-Nubuwat of my father. So these are their efforts. May Allah deflect all of enemy’s evil ploys back at them. these days the news that is circulating is not about the current events but rather about the 2013 visit when they had said that they would ask the Japanese government that because the Ahmadiyya Jama’at is a non-Muslim organization so it should be banned in Japan. This is the sum of their wisdom. This was all a description of the events in Nagoya. In Tokyo also there was a function and various dignitaries numbering 63 attended our reception. In this event a Chief Priest of Buddhism participated. Also the Chancellor of a University, a poet and many other dignitaries from all walks of life. The Chancellor of the University said that I kept thinking what will you convey to us but you have told us about various matters of the past and the future in 20 minutes. You have talked on the basis of truth and facts. You have advised us of the losses likely from war. You warned us regarding the future wars. In such a short time, you have explained the true teachings of Islam. He said with regard to my address that this message should be spread all across Japan in English and Japanese. Chief Reporter of Newspaper said: If Ahmadiyya Jama’at had not come in front of us through their services to humanity, we would have deprived of seeing this beautiful face of Islam. Then a friend of the Jama’at said that this speech of the Khalifa has opened our eyes and has made us aware of such things as we had never even thought about. Living in peace and security we could not even have imagined all the dangers you alluded to and how devastating war can be and how terrifying atomic attacks are – we learnt all these things today. Then another person said that the address of Hazrat Khalifatul Masih II (ra) condemning the atomic attacks on Japan was an extraordinary thing. This makes clear the stand of the Ahmadiyya Jama’at about peace very clear. The reference is to the address that Hazrat Khalifatul Masih II (ra) had given at the end of WW II which I had quoted from there and told that he had said that it is our religious and moral duty to declare to the world that we do not consider this type of shedding of blood to be lawful as was done by dropping atom bombs on Japan regardless of whether governments like or dislike this statement of ours. A Buddhist Chief Priest said that I am a Buddhist but having listened to the statements of the Imam of the Ahmadiyya Jama’at my eyes have shed tears. Then after a meeting with me he prayed with us and kept sitting there in the hall tearful. He had met me in 2013 also and he was told by a friend then to pray to God that He should show him His Being. He had responded by saying that I do not even believe in God what to pray to Him. But today this same Buddhist priest when he met me again this year he prayed with us and stayed there tearful. A Japanese friend says that I have learnt today that those people who associate Islam with Daesh are altogether wrong. The Khalifa of the Jama’at has given us a message of peace today. The world is moving today against the needs of peace and I am in agreement with the statements of the Imam of the Ahmadiyya Jama’at that we need to develop a change. The movements to bomb places that are being formed are all baseless and nothing but ways to take the lives of innocents. Then a Japanese lady said that I thought Islam was an extremely dangerous faith but today, after listening to the address of the Imam of the Ahmadiyya Jama’at I have realized that in reality Islam is the most peaceful faith which is most surprising for me. When the Imam of the Ahmadiyya Jama’at made mention of the 70th anniversary of the dropping of atom bombs on Japan, it became clear that Imam Jama’at is well aware of world events. And the love the Khalifa has for the people is most commendable. Then a Japanese friend said that it is proven by today’s speech that Islam-Ahmadiyyat is a very powerful peace loving religion. Most Japanese people think that Islam is a bad religion but I bear witness that your Khalifa is a personification of peace. The Khalifa advised that the errors committed 70 years ago should not be repeated and all that he said was based on truth. Then a Japanese friend expressed his sentiment in this way that today by listening to the address of the Imam of the Ahmadiyya Jama’at I learnt that how great a difference there is between ISIS and true Muslims. Whatever fears and worries that existed before in my heart all have been removed. And all that he said was true that we are going towards a third world war and the Khalifa drew our attention towards our responsibilities that we should do everything possible to stop this war. The a lady says that a lot of people join Islam with all that is bad but today I learnt that Isla is totally the opposite of this. Islam is a religion that promotes peace. She says that she is not very old and so she does not know much about WW II but the loving way that the Imam of the Ahmadiyya Jama’at has talked about the Japanese people I wish to commend him for that. Then a Japanese friend sat that there was a great message for all of us in the address of the Imam of the Ahmadiyya Jama’at. The message was that weapons of this era are far more dangerous and deadly than before. What the Khalifa has said is that this is not the time to enrage one against the other but to promote love between ourselves and it is the time to establish unity among ourselves. The Khalifa has specifically drawn the attention of us, the Japanese, towards our responsibilities because we know what type of destruction a war brings about. The Khalifa said that Japan should keep its history before itself and then be amongst those who are the foremost to stop and prevent every kind of disorder. Another friend said that you have come to invite the people of Japan towards the teachings of peace. Normally we do not have the chance to meet Muslims and I feel proud that today I have met a leader of Muslims. He says that we do not know when the war will happen and I used to think that it would certainly happen but now I think that we can stop this war from happening but for this to happen we will have to act upon the advice of the Khalifa. Then he said that I say without any hesitation that the teaching of Islam the way that the Khalifa is presenting is better for the people of this country. Journalist: This is a message of peace. You are correct and I respect your feelings towards Japan. What you are saying is indeed the need of the hour. I value that you feel the pain that we suffered from the atomic attacks. Many people narrated their feelings. A Japanese Muslim friend said that I am a Muslim but I have not heard any Muslim scholar mention such teachings. I am very pleased that Khalifa discussed from Quran. Khalifa mentioned everything placing Qur’an at it’s foundation. I have never thought of the third world war but have realized this is a relevant danger. Car company CEO said: Everything you have mentioned is relevant to our needs for the whole world. On the one hand people who hear our message say these things that Islam in reality is a religion of peace and on the other hand some of our western politicians keep saying there is a hint of extremism in teachings of Islam which is why Muslims are prone to violence. They do not think how many percent of Muslims are supporting these extremists? By saying such things that Islam’s teachings contain extremism, these politicians, whether they hail from the UK or from some other places, they will thus make even peaceful Muslims against them. And then there will be discord and unrest. So western politicians who hold the view that Islam contains extremist teachings should ponder and think and should not make statements without due consideration. And those Ahmadis who have contact with such politicians they should counsel them and make them understand that at this time the need for the peace of the world is that we should talk with wisdom and insight and not make such statements as cause unrest to spread in the world. May Allah grant them wisdom also. As I have mentioned, the clerics are full of malice and rancour especially in Pakistan and they go on expressing it here and there all the time. They are very envious when they witness our success. One extreme act of great violence occurred in Jehlum just recently. An Ahmadi owned chipboard factory was set on fire. They wanted the owner and the factory workers to be burned alive. But thank God they were not able to succeed in this nefarious goal. Nevertheless financial loss happened. They think by doig such things they can finish Ahmadiyyat or distance Ahmadis from their faith. About such people who go light fires Allah has made it clear in the Holy Qur’an that if they fail to repent, a punishment of Hellfire is destined them. As far as Ahmadis are concerned, in such hard circumstances the faith of the Ahmadis increases it does not decrease. It happened in 1974 when these people lit fires and tried to put Ahmadis through a trial but they failed utterly in their objectives. All their desires remained unfulfilled. Those who wanted to place begging bowls in the hands of Ahmadis we saw them begging alms. This has been the way Allah, the Exalted, has treated members of the Ahmadiyya Jama’at. These trials cannot shake our faith. Indeed they strengthen our faith. If financial loss has occurred Allah replaces it. There are innumerable number of Ahmadis who underwent such trials and Allah, the Exalted, bestowed upon them immensely. If these owners have suffered financial loss it also will be replenished. This chipboard factory belonged to Sahibzada Mirza Munir Ahmad Sahib, the son of Hazrat Mirza Bashir Ahmad Sahib (ra) – and then upon his passing away his children were the owners. I am happy at this that as it ought to be the expression of a momin, a believer, upon occurrence of such a loss, that expression was done by the owners. And their tongues uttered only expressions of thankfulness to God. Allah, the Exalted, kept all their Ahmadi workers safe and also safeguarded the lives and honor of all the women and children. Mirza Naseer Ahmad Tariq Sahib who is the oldest son of Mirza Munir Ahmad Sahib and runs the factory and resides in the factory. And similarly his son also who works at the factory. The son had left for Lahore an hour earlier in connection with the medial treatment of his wife and so was not present when the attack took place. But Mirza Naseer Ahmad Sahib and his wife were present in the factory. When the attack started they broke into his home. Their home was set on fire. But Allah wanted to save them and the Police arrived. Though they did not stop the mob. They saved them by taking them out by some back doors etc. Then they went over the wall and reached an open area in the jungle where they kept walking till they found a ride and then ultimately arrived at a safe place. Similarly many Ahmadi workers escaped into jungle and hid there and were eventually found by the khuddam and led to safety. A security officer of one of the gates was arrested and imprisoned and a very serious charge levelled upon him. May Allah make avenues for his freedom. His name is Qamar Ahmad. May Allah also bless those incharge of dispensing justice that they act with justice. Similarly Mirza Naseer sahib was placed under house arrest but then later was released after being made to give assurances that he would show up when asked etc.. In other words the mobs were given full freedom but those who incurred this loss and were treated as criminals. Mirza Naseer Ahmad Sahib is also the Ameer of Jhelum District. From the way that the attack unfolded it seems that the event was pre-planned. They had thought it appears that if we will get a hold of the Ameer then the rest of the members would just run away. People inside the factory did not realize what was happening so much so that it was even difficult for them to save their lives and run away. The mob had gathered in their hundreds, rather thousands and had arranged for bulldozers and had brought all the necessary items to set the factory on fire and they kept gathering there for quite some time but the police did not come. The police and the other law enforcement agencies showed up only very late into things, well after the fire had been set. In any case this is their favor that they helped save the owner and a few others and took them out to safety. I have received a letter from the wife of the daughter in law of Mirza Naseer Ahmad Sahib, who also used to live in the factory, that when she went to visit the wife of Qamar Ahmad Sahib who has been arrested and charged with desecrating the Holy Quran – a very serious charge – she says that when she went to meet her she was utterly amazed to see that she was smiling and perfectly content as if nothing had happened – whereas her husband has in fact been charged with a very serious crime. May Allah, the Exalted, increase the patience and courage of Qamar sahib’s wife and give the enemies the taste of the punishment of their misdeeds. The expression of patience and contentment that Mirza Naseer Sahib and his wife and their children have expressed is also worthy of mention. I was concerned that under such circumstances no words of ingratitude should emanate from the mouth of any of them. But from the letter of his daughter in law and son and I have myself talked with Mirza Naseer Ahmad Sahib and the letters that I have received from their near and dear ones it is apparent that they are all fully content with the decree of Allah. May Allah reward them. By virtue of their blood relation with the Promised Messiah it is good that they showed such exemplary patience and courage. Wealth comes and goes, as I have said. The God that provided before will provide again and can even bestow in greater measure and indeed will bestow in greater measure. May Allah also free them all from the false charges levelled against them. And especially, may Allah grant freedom to Qamar Sahib who was incharge of security at the gate and who is being charged with the grave crime of desecration of the Holy Quran whereas if anyone has a sense of respect and honor due to the Holy Quran it is only an Ahmadi who knows this more than anyone else. In any case one good thing that has happened and we have this time i that some non-Ahmadis have also raised their voices against this attack. One tv program also discussed this in which the local politicians also participated. The presenters spoke against this and the participants in the program said that they would go after the culprits and seek justice. After burning the factory, the mob attacked two of our Jama’ats and attacked the mosques. One of the mosques has been sealed. First the mosque was attacked by the maulvis. Then they took out the prayer mats and lit the items on fire, then they washed the mosque and offered prayers there. But then the police and law enforcement people took it from them and locked it and sealed the mosque. So although the mosque is not in their possession these two Jama’ats are still in considerable danger. May Allah safeguard the Ahmadis in those areas. May Allah enable justice to prevail in Pakistan. May Allah also provide for the factory workers who are now unemployed. Aameen!